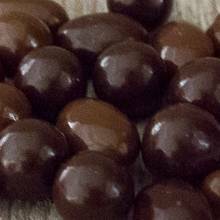 A delicious mix of caramels and roasted nuts smothered in milk and dark chocolate. The perfect mix and the perfect treat for chocolate and nut lovers. Price quoted is per pound, not including shipping. Ingredients: Milk chocolate (sugar, whole milk, cocoa butter, cocoa mass, soy lecithin, vanilla), dark chocolate (sugar, cocoa mass [processed with alkali], cocoa butter, butter oil, soy lecithin, vanilla), sugar, almonds, macadamias, pecans, cashews, walnuts, cherries, dried apricots (with sulfur dioxide to retain color), tapioca syrup, cream (milk), palm kernel oil, tapioca dextrin, cocoa powder (processed with alkali), natural flavor, artificial colors (yellow 5, blue 1), invertase, citric acid, salt, confectioner's glaze.